I always know when we're getting close to opening a show because Linda Besant starts bringing groups of people in to observe studio rehearsals. I hope our audience doesn't mind that I snuck a picture of them watching us in our natural habitat. This was a rehearsal for the Act I pas de trois. Christopher and Lisa are sitting next to the CD player in the center of the room (at the left side of the photo), which is their usual vantage point from which to best see all the dancing action and take note of what needs fixing. I've always thought these open studio rehearsals must be pretty neat for people to sit in on--- things are not quite as unpolished as the work we usually do at OBT Exposed, since we're further along in the rehearsal process, but we're definitely not putting on a show just yet, so there is plenty of stop-and-go, correct this and that, try steps over and over again. It must be curious for already-interested observers to see and hear how we arrive at the finished product they see on stage. Maybe when they go to performances they can even recall seeing certain sections being rehearsed, and compare how it looked then with how it looks on stage, in costume, with lights, sets, orchestra. I'm pleased to announce that I finally accomplished what I set out to do a while ago: form an organized OBT supper club. The idea for such a thing was born during one of many happy hours with Candace and Brennan, when we agreed that we should combine our mutual love of cooking and eating for the greater good. Such a club would be a great opportunity, we reasoned, to improve our culinary skills, expand our palates, dabble in wine pairings and clean our respective apartments. I set the date and last Sunday, September 14, our fledgling supper club had its first official meeting. It was dubbed the Finer Things Society in honor of an episode of NBC's "The Office." That, and because I waited until after I had a paycheck to buy nice, fine ingredients for our dinner. All dishes made from scratch, I may add. I found my recipes in a recent issue of Bon Appetit, and both Grace and Steven utilized produce from their families' gardens. This is the Finer Things Society, after all. That being said, my arm's still sore from grating all that cheese. Anyway. Dinner proved to be a huge success. The food was delicious, the wine a perfect accompaniment, the company animated and jovial. After we'd licked our plates clean of pie the four of us lounged about my living room nursing the last of our wine and basking in the warm glow of my television. Granted, "True Blood" might not be the Finest Thing to end an evening with, but it is entertaining. And it is HBO. I look forward to our next meeting, which is scheduled two weeks from now at Brennan's place. We haven't decided upon a menu yet but Brennan, always the finest host, is relishing the chance to decorate his apartment with pumpkins and fall foliage. I hope to expand our membership to anyone in the company who's interested; while I wouldn't want a single individual to cook a mess of food for thirty people I'm sure we could organize ourselves suitably. Our goal is to meet every other Sunday on weekends where we have Saturdays free of rehearsals, rotating who plays host, who provides dessert, who plays sommelier, etc. I'm sure there will be weekends where we are bone-tired and cannot fathom putting together a thoughtful and elegant dinner for company. The Finer Things Society is absolutely allowed to hold meetings at restaurants and pubs. A meal may also consist of Chinese takeout, some cold beer and stale fortune cookies. There is most certainly a place in the Finer Things Society's heart for irony. I'm Raychel Diane Weiner and I am one OBT's newest hires. I am so excited to be here in Oregon and to be joining the OBT family. Coming here I was nervous and excited!! Nervous because I have to dance in the same room as some of the most talented dancers I've seen, and excited for that very same reason. As soon as I stepped foot into the studios I felt at home. All of the dancers were more than welcoming, as well as the entire staff. Even though it's only been three weeks I already feel as though I have made friendships that will last forever. I have never had the opportunity to dance the ballet Swan Lake, so rehearsing for our October performance of the ballet has been a lot of fun! AND EXHAUSTING!! I found it hard today to keep focused, because I was distracted by Alison, Yuka and Kathi looking absolutely phenominal dancing the role of Odette. Not to mention Artur and Ronnie doing an amazing job making sure that the ladies were presented as the beautiful swans they are. More on the "Wall of Tulle"
The photo in Steven's earlier post shows the most recent upgrade/renovation/addition to the OBT building--- three rows of (extremely heavy duty) hooks secured onto the wall in the basement hallway, oppostite wardrobe and the women's dressing room. As Steven explained, during rehearsals for a ballet like Swan Lake all the women need to wear practice tutus, which take up a lot of space not only on stage but also everywhere else. Our dressing room at the studio is cozy enough without fifteen or twenty extra puffballs of tulle needing a place to live, so Ed Lyle, our facilities manager, put up those hooks the other day for us to store the practice skirts on. Previously they'd been stuffed on top of lockers, hung from pipes near the ceiling, or piled in the shower room. Yay! This season also marks the first time there are actually enough practice tutus to go around. Our intrepid wardrobe department took the time this summer to make several new ones and weed out the old ones that were in such a sorry state they were pretty much useless. (One day Kathy Scoggins and I went on a "tutu hunt" in the dressing room to pull out all the old ones from their hiding places. It was like "Where's Waldo" trying to find all of them!) Again, as Steven explained, practice tutus are not the same as actual costumes, but oh the joy of having one that really fits and isn't embarrassing to wear! The old one I'd been using the past few seasons kept falling apart, so I'd been tacking it together myself from time to time with dental floss. (That's what I sew my pointe shoes with and was the only thread I had around... I'm no seamstress). To echo Steven's comments on the importance of using these practice tutus, I'll just say that the experience is pretty much the same for the women--- without a bodice, of course things feel much different (more breathing room and freedom of arm movement), but just having a saucer around your waist is an unusual feeling to dance with. Turns need some adjustment and the view of your legs is different, so they need some extra attention to detail. The Romantic tutus are fun because you feel, well, romantic and playful, but there is a lot of material getting caught up around your legs as well as extra weight to get used to. Sometimes the actual costume is a little easier to work in for one reason or another, but I usually feel like a completely different animal in it, for better or worse! So, I know during the Russian Program we talked a lot about building and designing the tutus for Raymonda, but I don't remember if we ever talked about the difficulty involved in partnering a girl in a tutu. When we first learn to partner girls in ballet school, they are usually just wearing a leotard and tights. No skirt, no warm-ups, nothing that you can catch you hands on or will slip off and get in the way. However, once a girl gets a tutu on, it changes a lot of things for the man. We become very used to being able to seeing the girls legs, feet, and hips and sometimes rely on that to gauge balance, but once she puts on a tutu, those visual ques are gone and you have to rely more on the weight you feel in your hands instead of what you can see. For a while after you start partnering someone in a tutu it feels a bit like you're blind, but as with losing any sense, the others seem to become heightened. When we do a ballet like Raymonda or, what we're rehearsing right now: Swan Lake, we use practice tutus. They are a little bit different from normal tutus. Sometimes they are not as big, or don't have as many layers of tulle. They don't have the bodice attached to them, so it's just the skirt part of the tutu. But, it's enough for the men to get used to the feeling. Swan Lake is a bit different from Raymonda in that we aren't only using the saucer tutus, but we're also using what's known as a Romantic Length tutu (we used to call them four-fours at my old studio. Get it?). They are longer and more skirt like and go to somewhere below the knee. Which can make it easier when turning the girl because you can almost see the legs, but can get in the way of big lifts because there is so much more fabric flying around. Once we get on stage and start using the actual performance tutus I always feel so grateful for having used a practice tutu in the studio. When you're having to worry about spacing, lighting, and choreographic changes the last things I want to think about is how to partner effectively. The last sort of challenge comes in the addition of the bodice to the tutu skirt. There is sometimes a lot of embelishing on those, which can sometimes scratch your hands (I've heard horror stories involving too many sequins on the waist of a tutu which resulted in a partner with bloody hands). The tutu bodice is also made from a much stiffer fabric than the leotards that the girls wear in rehearsals, which can be both a blessing and a curse. It's makes the girl feels more like once solide piece, and therefore easier to partner, but it can also be hard to grab a hold of for lifts. I know there are some challenges for the ladies involved in dancing in a tutu as opposed to a leotard and tights. Maybe Gavin or Mia (or both) would be interested in sharing some of those thoughts? Well, I'm off to enjoy this AMAZING weather. Hope you all have a fantastic weekend! A long overdue blog about my summer. In June, following our debut at the Kennedy Center, Kathi Martuza and I flew to Idaho to dance for a small school located in Eagle, ID, a suburb of Boise. We had the gig lined up in advance, and it turned out to be really fantastic. The performance was in a vineyard (see photo), where we performed the Adagio Movement from Yuri Possokhov's Raymonda and the Paseo (or tango) from Kent Stowell's Through Eden's Gates. I had a great time with my colleague, and had a great time representing OBT outside of Portland. After Idaho, I visited my home in Nebraska, which was great for some down time. It was great to rest, relax and dine on fantastic food (meat and potatoes) from my Midwestern home. When I was home I had contacted a friend that I used to dance with and she now owns her own studio in my hometown. She signed me up to teach a few classes at her studio: ballet I and II, contemporary, and jazz. It's been years since I've regularly attended a jazz class; however, I did the best I could. By the end of the week I told my friend that the next time I come back to teach that I'd rather just stick to ballet. I had the opportunity to teach a few classes elsewhere around town, several of which I had no idea that I was signed on to teach at. I had several students that I used to dance with email me and ask if I was coming to teach at my former studio. All the while, I had not been in contact with any other studio in the Omaha area; however, I ended up being on the roaster's of three different ballet schools to teach class. I made it to all of them and enjoyed every aspect of teaching. I had a great time teaching. I was nervous initially, but then I warmed up to it and enjoyed seeing things from "the other side." Dance is special because the only way to pass it on is through dancing; there is no form of notation for dance, and the greatness of the art is passed on through great teachers. It was a new experience to go back through my training and highlight the things that I found most important to teach these kids in the selected time I had with them. I only had them for a week, so I couldn't convey everything I wanted to within such a short time. But I learned that I enjoyed sharing the special things that have been taught to me by all the teachers I've had; and I also learned that teaching makes me a better dancer, because when I correct someone, I (hopefully) apply it to my own dancing as well. Teaching reminded me of my history, and how every class I've taken and every teacher I've had has impacted me. I remember the good and the bad and applied them to the way I taught class as well as the way I take class. I feel like I carry a little piece of every teacher I've ever had; therefore, teaching is imparting the wisdom of all the great teachers I've ever had. Hopefully teaching will be something that I can grow in as I have more opportunity. And while teaching was a really great resource to explore a different side of dance in, my summer was very much lacking in dance for myself. As I returned to Portland and began taking class and attempting to get back in shape, I felt so grateful to be dancing again. I really missed it. Now, as we are thick into Swan Lake and my body is reacting adversely, I am truly glad to be back in the studio in "rehearsal mode" preparing for our debut of the season. Things Ballet Dancers Like To Do When They Get Home From Work. Which version of the Nutcracker did Gelsey Kirkland dance? New York City Ballet's or American Ballet Theatre's? Both, actually! Ms. Kirkland began her career at City Ballet where she danced the Balanchine version. She later joined ABT however, and famously danced the role of Clara in the 1977 televised version of Mikhail Baryshnikov's Nutcracker. That's probably the performance you're thinking of. Do other ballet companies ever change Nutcrackers? It's actually pretty common for companies to make the switch every so often in order to keep things fresh for the audience and the dancers alike. Ballet companies that have unveiled a new Nutcracker in the past ten years include: San Francisco Ballet, Washington (DC) Ballet, Boston Ballet, Cincinnati Ballet, Ballet Arizona, Pittsburgh Ballet Theatre, and Nashville Ballet (which debuts its new production this December). Even though work technically started last Tuesday, work really started for me today. Due to Swan Lake relying so heavy on the ladies, some of us men have either had very little rehearsal, or none at all; I fall into the later category. So, finally getting to rehearse something today felt wonderful! It so great to finally be back in the studio learning and working on choreography after almost 3 months of only taking class. It’s such a different mentality and focus between taking class and learning a ballet. In class we have to memorize combinations quickly, but we’re also allowed to forget them fairly soon after. In rehearsal you have to try and learn quickly, but also retain the choreography, spacing, and the corrections you get for at least 7 weeks. Granted, there are lots of rehearsals for the ballet, but no one wants to go back over material that has already been taught more than 2 or 3 times. It’s our responsibility to go home and go over what we’ve learned that day, and try to get it cemented in our memory (I once heard that you’ll have the greatest chance of retaining something if you go over it within 24 hours of learning it). As rehearsals progress I’ll probably post more blogs, hopefully with some pictures of the rehearsal process, and maybe a video or two. Adrian and I have been talking about trying to put together some behind-the-scenes videos for all of you, but I’m not sure what that will look like yet, or when it will happen. Soon hopefully! This summer I had a wonderful opportunity that I thought would be fun to share with all of you. In June I was contacted by my old pre-school/kindergarten and was asked if I would like to come and teach for their arts camp in August. I was very apprehensive at first, I had never taught anyone that young before, and I find trying to keep the attention of middle-schoolers to be a challenge, I could only imagine what it’s like with kids of that age! After some thinking, I decided to agree, both because it’s something new and challenging, and because that school is where I took my very first dance class. It was taught by Kasandra Gruener (OBT’s current director of Education and Outreach, and a fantastic teacher) and was a part of the various programs we could choose to do through the school. It was the class that began me on my long road to where I am today and I felt that, even if no one from that class would ever want to become a professional dancer, at least I would open their eyes to a new possibility. After agreeing, I talked with Kasandra about various exercises to do, what music to use, and how to keep the kids attention. I wanted to give the class more of a “ballet” focus as opposed to simply “creative movement”, so that figured into my planning as well. In the end I created two half-hour long classes that seemed like fun and would have some continuity from the first class to the second. I was SO nervous the first day. Like I said, I’ve never taught pre-schoolers, and it’s been years since I’ve even babysat anyone around that age. In the end, I think it was probably the highlight of my summer! The kids were all so wonderful and attentive. I even had a few of them (both boys and girls) tell me that when they grew up they wanted to be a ballet teacher just like me and they wanted to give the exact same class that I had given them. I know they are young, but still, it kind of melts your heart to hear that. :-). I had one of the class aids take some pictures on the second day for me to post here. The last picture is of a banner that the kids made me as a thank you. I put it up in my apartment firs thing when I got home, and it still makes me smile whenever I look at it. Getting everyone lined up to go across the floor. Telling the story we are going to dance, "The Pixies in the Garden." It sounds silly, but it's pre-school gold. Flowers growing out of the ground. Here's a photo of Alison and Steven taken during last week's First Thursday festivities. 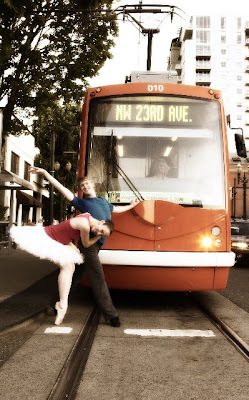 It comes to us courtesy of our good friends lululemon athletica who sponsored OBT's mobile performance throughout the Pearl District. Alison, Anne, Candace, Ronnie, Adrian and Steven danced on street corners and sidewalks all over the neighborhood (with an audience in tow) before finishing the evening at the kick-off event for the OBT Associates, our new group for young professionals. If you'd like to learn more about the Associates, send an email to associates@obt.org! Major kudos are in order to the intrepid dancers who performed yesterday at Riverfest's South Waterfront Day. The apprentices and advanced students danced the ballet David Justin completed a couple of weeks ago during OBT Exposed, and then Alison and Artur performed a pas de deux from Swan Lake. They all looked very impressive despite contending with a tiny stage and the blazing sun directly in their eyes. Afterwards, Damara taught a little class to any kids in the audience who were brave enough to come up on stage. That must have been thrilling to them--- I can imagine myself being unrestrainable if I had had that opportunity when I was seven or eight! I don't have any photos, but maybe someone else who was there and took some can send them my way so we can share with everyone else?? In other news, Swan Lake is starting to slowly take shape. There are skeletal bits of sections coming together so far, such as the swan corps in Acts 2 and 4, and the Act 1 dances for the peasants and the pas de trois. There's an amazing amount of choreography to teach, learn, and clean up. Throw into that the fact that it's pretty much all extremely demanding material for literally every role in the ballet, and you're looking at a bunch of people getting whipped into shape, fast! Thanks to everyone who's participated in our Nutcracker survey. We received over 1000 responses in the first 12 hours alone! Look for the results next month. Is OBT thinking about doing away with the Nutcracker altogether? Absolutely not! We're only considering whether or not to replace the Balanchine version that we've performed since 2003 with a brand new production created especially for our dancers and our audience. If you've seen Christopher's Swan Lake or A Midsummer Night's Dream, you already know how exciting it is for all of us to have a full-length work that we can truly call our own. We assure you that we're not doing away with the Nutcracker. Even if you're not the world's biggest fan - and we know that there are a few of you out there! - you should be aware that the Nutcracker accounts for well over half of our ticket sales each year. So even if it's not your favorite, you can still take comfort in the fact that it goes a long way toward helping support the other works we perform throughout the season. And who knows: a new production might be just the thing to make you fall in love with the Nutcracker too! What exactly do you mean by a "new Nutcracker?" Would you change the story drastically or turn it into a modern, abstract work? You can expect some twists and turns along the way, but any new production we create would still be very traditional in nature. We can't share any details yet about what Christopher's considering, but the story would still take place in a magical, Old World setting. The Rat King, the Snowflakes and (most importantly) the fantastic dancing aren't going anywhere. So if you're worried about the Land of Sweets being transported to the food court at the mall, or the Prince and Marie making their exits on skateboards or rocket ships, don't be! And how about those "enhanced special effects?" What does that mean? Sorry, we didn't mean to scare you with that one either. We're definitely talking about the sort of stuff that would fit within a traditional theatrical environment. There won't be any laser light shows or car chases. Why don't you just make changes to the Balanchine version? With very good reason, the George Balanchine Trust is very particular about preserving Mr. B's works and ensuring that they're performed exactly the way he choreographed them. We're not allowed to change anything about them at all - nor should we be. How about bringing back James Canfield's Nutcracker? For starters, we no longer own the sets and costumes to that production. Also, we'd like to build on the precedent that James established. He set the bar high! His Nutcracker was fantastic and was a cherished holiday tradition in Portland for ten years. That's exactly the sort of magic we'd be aiming to capture with a new production. Will you give us advance notice if you do switch to a new Nutcracker? Definitely. You'd know at least a year in advance. And if you're a season ticket holder or subscribe to our e-newsletter, you'll always be among the first to find out about everything we've got planned! Since 2003, OBT has performed George Balanchine's 1954 version of the Nutcracker. Is it time to create our own all-new production of the ballet, with new choreography, sets and costumes? You can help us decide! Please follow the link on our home page to a quick, 15-question survey. Every vote counts! Amazingly, it's here. I am offically "back", as we say (dancers are "out" when they're injured and "back" when they're, well, back) and tomorrow is the first day I will be rehearsing, almost six months after ankle surgery. Now that I'm sitting here at this vantage point, six months doesn't seem like a very long time. In fact, I almost can't believe the journey of these recent months even happened--- really? My big daily expedition was crutching down the block to the coffee shop, and even that was exhausting? Going up and down the stairs to get the mail was a daunting task? I relied on doing the James Brown shuffle to get a cup of tea from the stove to the table on one leg without hopping? And then, finally, released from that crazy cast, my leg quivered like a leaf when I merely stood on it? During those times I don't think I truly thought about the future. I dealt with each day, each hour in fact, as they happened. It was just too difficult to imagine the future without fear. I may be dancing again, but I am far from normal (or from where I started). My ankle is not the same as it was, and may not be for a long time yet. But I'll start out into this new phase of things and just keep taking it one step at a time. I can't wait to get back in there and do my thing.